Over the years, we have all seen a lot of damage to the once prestigious worldwide Iskcon organization. Now, it is only a mere shadow of its past glory. And here below is one key reason. The present leaders of Iskcon have minimized the actual instructions of Srila Prabhupada, and created their "own" version of Bhakti Tattva. Starting every day with the offering of bhoga to turn it into Krishna Prasadam thru the un-authorized gurus of Iskcon, everyone there is eating sinful foodstuffs, and not Krishna prasadam. Prabhupada: Who is my disciple? First of all let him follow strictly the disciplined rules. Prabhupada: Then he is all right. Without going into all the hundreds of changes the Iskcon GBCs have authorized, merely changing whimsically, only ONE instruction, disconnects themselves from the param para and renders that "service" useless. What to speak of main instructions-like first of all-HOW TO OFFER FOOD TO GOD !! Now here below is the actual words of Srila Prabhupada , where he tells his early disciples the process of offering bhoga or food to God, Krishna. And there are many other quotes like this one. "Regarding your question about offering Prasadam, whatever is offered to the Deity actually it goes through the Spiritual Master. The Spiritual Master offers to Lord Chaitanya, and Lord Chaitanya offers it to Krishna. Then Radha Krishna eats, or Jagannatha eats, then Chaitanya Mahaprabhu eats, then the Spiritual Master eats, and it becomes Mahaprasadam. So when you offer something, you think like that and chant the Gayatri mantra, and then everything is complete. At last, ring the bell, take out the plate and wipe the place where the plate was kept." "One who understands and appreciates the disciplic succession is certainly advanced, and we should always be very careful to give full respect to those who have so carefully handled this Divine Fruit of transcendental knowledge before us. Even a slight change will spoil it. That is why I have always been so careful to give you only those things which I have heard from my Guru Maharaja "
…do we follow Srila Prabhupada’s personal example or the shastra that he gave us??? My contention is that we must follow the shastra that he has given us, and we must not imitate his personal example when it does not technically follow shastra. So the system of arotik in all Gaudiya Vaishnava temples is to first pay obeisance to the guru and take his permission for worshiping Lord Krishna. Then worship Krishna first and then Radha then Mahaprabhu and the guru parampara in descending (senior to junior) order, lastly the arotik items are to be offered to the assembled devotees. In ISKCON Srila Prabhupada instituted another order offering the items to the guru first. In this case the item cannot technically be offered afterwards to the Lord having first been enjoyed by the guru. This is technically not correct. Therefore we must in this case follow shastra and adapt our worship method to the one followed by all Vaishnava sampradayas. The doctrine or principle of worshiping the guru first is correct but the technicality of HOW that is to be done is incorrect. By the way this system is followed in most temples in Europe where I standardized the deity worship in the 1980s. It is not followed in some temples like LA because some Prabhupada disciples find it difficult to accept and they have no experience of the correct technical details as practiced in India. The greatest danger to our movement will come when we manufacture and create our own process for worshiping the deities. So don't ask any more new questions, whatever is going on, follow it just to the exact standard as I have given you, that's all. 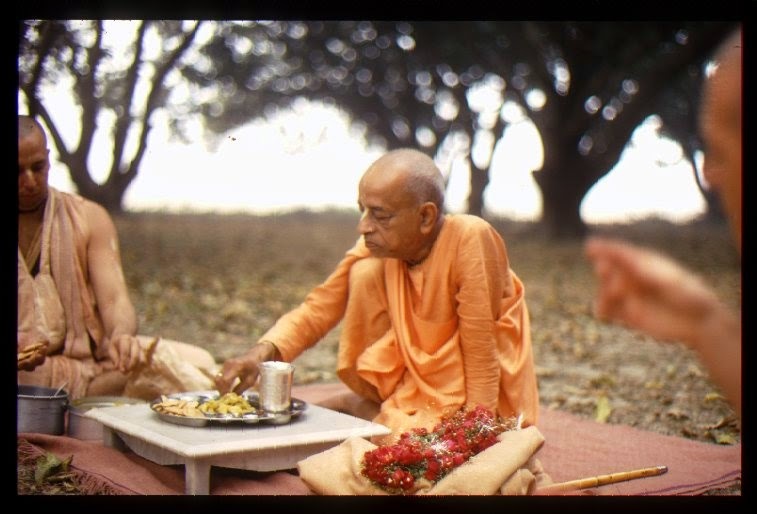 The reason Iskcon, thru Gaura Keshava, and before that, all the Gaudiya matha in India, have taken to this system of offering bhoga to Krishna is because they have disobeyed the orders of their own Acharya - both Srila Bhaktisiddhanta Maharaj and our Srila Prabhupada in the matter of who is to become "guru" or Acharya of the institution when the real acharya departs. Since both the Gaudiya matha and Iskcon disobeyed their Acharyas orders (Gaudiya matha was to not elect any Acharya but work together and an Acharya (Srila Prabhupada) would emerge amongst themselves, and Iskcon’s order from Srila Prabhupada was to have ritvik priests take on the business of initiating new disciples on behalf of Srila Prabhupada--because neither of these organizations did what they were told to do, the result was so many fall downs amongst their so called guru leaders, that they were forced to amend the offering process so that food would be offered first to God, or Krishna and not to fallen gurus, so that way they felt, everybody would be "assured" of having only Krishna Prasadam to take. Only thing is - it's all wrong !! One doesn't go to God directly, but has to go thru His representative-for everything!! Even the Christians know this as Jesus said "only thru me can you go to the Father". Therefore, the conclusion is - it is not acceptable by Krishna because they have not followed His order and system to approach Him. This approach, Iskcon's way, is very arrogant since they think they can directly go to God and bypass their own guru. Since Iskcon's own "gurus" are constantly falling down, then how can the blind followers be assured the offerings they personally make to Krishna, thru their own Iskcon guru actually go to God, or Krishna? This is a big problem for the GBC. So what do they do? They change it all around to fix their current problem - gurus who are constantly falling down, by saying - No we don’t offer to guru first but to Krishna, then it comes back to us as "Prasadam". The only thing is all they are getting - is contaminated kali yuga "prasadam" and not pure 100% transcendental Krishna Prasadam. Now here below we hear from Krishna's actual representative, Srila Prabhupada, where he explains that if a guru is bogus, (which he becomes- simply by changing only one item of devotional service, what to speak of hundreds of other changes) then how can anyone go forward to Krishna, with any kind of devotional service or bhakti yoga from that incorrect starting point??? If you add 2+2 and get 5, even if you do everything correct after that, it’s still all----- WRONG !! Devotee (3): In regard to worshiping arca-vigraha form, you have explained that if one receives a mantra from a spiritual master who is not bona fide, that mantra has no effect. So I would like to ask if one is worshiping a Deity and his spiritual master is not bona fide, so that Deity cannot be considered the Supreme Lord? Prabhupada: Well, first of all, thing is if the spiritual master is not bona fide, how his mantra can be bona fide? Your statement is contradictory. If you say the spiritual master is not bona fide, then how his mantra becomes bona fide? If he is bona fide, then his mantra is bona fide. Devotee (3): Then why is he giving instruction to worship the Deity? If the spiritual master is not bona fide, then is the Deity also not bona fide? Prabhupada: I do not follow. What does he say? Prabhupada: Then there is no question of mantra. There is no question of worshiping Deity. These are all bogus things. If you are not... Just like here is a young medical man. If he has not received instruction from a bona fide medical college, so what is the value of his medical, being... That is... What is called? What is the technical name? So for that there are so many practices, regulative principles, mentioned here. The first thing is hamse gurau mayi bhaktyanuvrtya. This is religion. Adau gurvasrayam. If you do not get a qualified guru, then everything is bogus. If you, by good fortune, if you get the association of a guru, qualified hamsa, paramahamsa... Paramahamsa guru means sannyasi's last stage is paramahamsa. Kuticaka, bahudaka, parivrajakacarya, and paramahamsa, these are the different stages. .....then he is paramahamsa. So one must find out a guru who is paramahamsa. Neither kuticaka, nor bahudaka, nor parivrajakacarya. Paramahamsa. So we have to accept religious principles from the leaders of the sampradayas. Otherwise it is useless. Sampradaya-vihina ye mantras te viphala matah: "If you do not accept mantra initiation from the disciplic succession of the sampradaya, then it will be useless." Sampradaya-vihina ye. So people are manufacturing religion without any reference to these authorities. Regarding the disciplic succession coming from Arjuna, disciplic succession does not always mean that one has to be initiated officially. Disciplic succession (also known as initiation) means to accept the disciplic conclusion. Arjuna was a disciple of Krishna and Brahma was also a disciple of Krishna. Thus there is no disagreement between the conclusions of Brahma and Arjuna. Vyasadeva is in the disciplic succession of Brahma. The teachings to Arjuna was recorded by Vyasadeva verbatim. So according to the axiomatic truth, things equal to one another are equal to each other. We are not exactly directly from Vyasadeva, but our Gurudeva is a representative of Vyasadeva. Because Vyasadeva and Arjuna are of equal status, being students of Krishna, therefore we are in the disciplic succession of Arjuna. Things equal to the same thing are equal to one another. So, if one has a guru (in Iskcon) who is not authorized by Srila Prabhupada and/or his instructions are contrary to Srila Prabhupada’s, then how the offerings made are Prasadam?) And on the other hand, if you DO follow Srila Prabhupada’s instructions, then the result is Bhakti yoga or pure devotional service if done under his instructions. The chanting of Hare Krishna is our main business, that is real initiation. And as you are all following my instruction, in that matter, the initiator is already there. Now the next initiation will be performed as a ceremony officially, of course that ceremony has value because the name, Holy Name, will be delivered to the student from the disciplic succession, it has got value, but in spite of that, as you are going on chanting, please go on with this business sincerely and Krishna willing, I may be coming to you very soon. Similarly here, because if one follows the real guru’s orders, then he is present there and the food offered does go to Krishna and return to us as prasadam. Unlike the Iskcon scenario where the link to God, Krishna, has been cut or severed by their unauthorized methodology of first offering to God. As Prabhupada says - "these are all bogus things." Allow me to congratulate you and your wife for giving birth to a new child. Now see that she is raised in Krishna Consciousness so that at the end of this life she can go back to Home, back to Godhead. As far as my blessing is concerned it does not require my physical presence. If you are chanting Hare Krishna there and following my instructions, reading the books, taking only Krishna prasadam etc., then there is no question of your not receiving the blessings of Lord Chaitanya whose mission I am humbly trying to push on. OK, now let us depart to a slightly different topic. Assuming we are all on the "same page" with the above, let us see about accepting foodstuffs from impure places and people, and whether or not THAT is acceptable by Krishna??
" 'My consciousness is impure because I (Raghunatha das Goswami) accept all these goods from people who are interested only in pounds, shillings and pence. Therefore by this kind of invitation I only get some material reputation. Srila Bhaktisiddhanta Sarasvati Thakura remarks that people who are under the bodily conception of life are called materialists. If we accept the offerings of such people, place them before the Lord and invite Vaishnavas to partake of the prasada, that attempt will gain us only a material reputation, not the actual benefit of service to a pure Vaishnava. One should therefore try to serve the Supreme Personality of Godhead by fully surrendering at His lotus feet. If one engages for the service of the Lord whatever money one has honestly earned, that is spiritual service to the Supreme Personality of Godhead, the spiritual master and the Vaishnavas. Srila Bhaktisiddhanta Sarasvati Thakura says that people who are advanced in learning but attached to material enjoyment, who are puffed up by material possessions, by birth in an elevated aristocratic family or by education, may offer show bottle devotional service to the Deity and also offer prasada to Vaishnavas. Because of their ignorance, however, they cannot understand that since their minds are materially polluted, neither the Supreme Personality of Godhead, Lord Krishna, nor the Vaishnavas accept their offerings. If one accepts money from such materialistic persons to offer food to the Deity and Vaishnavas, a pure Vaishnava does not accept it. This causes unhappiness for the materialists because they are fully absorbed in the bodily conception of life. Therefore they sometimes turn against the Vaishnavas. "When one eats food offered by a materialistic man, one's mind becomes contaminated, and when the mind is contaminated, one is unable to think of Krishna properly. Srila Bhaktisiddhanta Sarasvati Thakura suggests that people who are materialistically inclined and sahajiyas, or so-called Vaishnavas who take everything very casually, are both visayi materialists. Eating food offered by them causes contamination, and as a result of such contamination, even a serious devotee becomes like a materialistic man. There are six kinds of association -- giving charity, accepting charity, accepting food, offering food, talking confidentially and inquiring confidentially. One should very carefully avoid associating with both the sahajiyas, who are sometimes known as Vaishnavas, and the non-Vaishnavas, or avaisnavas. Their association changes the transcendental devotional service of Lord Krishna into sense gratification, and when sense gratification enters the mind of a devotee, he is contaminated. The materialistic person who aspires after sense gratification cannot properly think of Krishna. "When one accepts an invitation from a person contaminated by the material mode of passion, the person who offers the food and the person who accepts it are both mentally contaminated. Srila Bhaktivinoda Thakura says that there are three varieties of invitations--those in the mode of goodness, those in passion and those in ignorance. An invitation accepted from a pure devotee is in the mode of goodness, an invitation accepted from a person who is pious but materially attached is in the mode of passion, and an invitation accepted from a person who is materially very sinful is in the mode of ignorance. So do not think that "We have made such nice, sumptuous plate for Krishna. Krishna must eat." No. There is no such thing, "must." You cannot make Krishna must. That is not possible. So Krishna will see how much you have love for Him. Then He will accept. Otherwise He'll reject. Therefore, it is forbidden, those who are nondevotee,those who are not initiated, those who are not chanting regularly, their offering to Krishna will not be accepted. We must be very careful. We must know our position, whether I am sincerely following the principles of devotional service. Then Krishna will accept. Yo me bhaktya prayacchati. The real thing is bhakti. So either you offer Krishna prayers or you offer foodstuff, everything must be along with bhakti, devotion, love. Then Krishna will accept. Conclusion----Srila Prabhupada has said, spiritual life is like a razor’s edge! !